Public Bank has partnered with and Alibaba Group’s affiliate company Ant Financial Services Group, to offer Alipay mobile wallet services in Malaysia. In a statement to A+M, Public Bank which is Malaysia’s third largest bank, said the deal will connect Malaysian merchants with Alipay mobile wallet services, an online and mobile payment solution. For now, Alipay mobile wallet services is primarily catered to the needs for Alipay users from China who frequently travel and shop in Malaysia, offering the convenience of payment service over carrying large amounts of cash. Public Bank is the latest bank to join in the mobile wallet service bandwagon, after its peers Maybank and CIMB entered similar deal with Alipay in March this year. 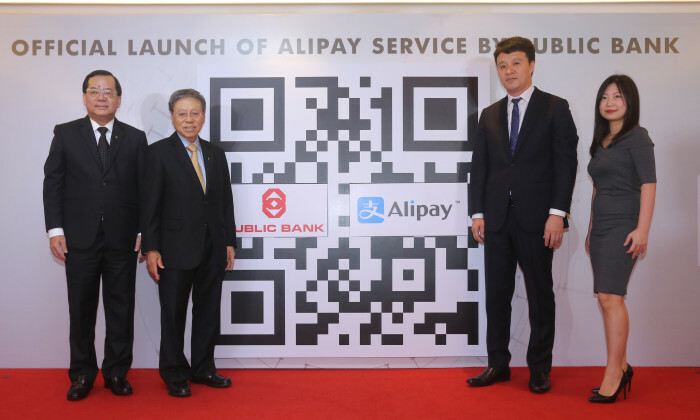 With the expanding business alliance between China and Malaysia, Public Bank said it believes offering the seamless Alipay service to its existing and new merchants will assist to increase their sales in view of the greater opportunity, from the 520 million Alipay active users. Besides, the banks said it also wants to provide Alipay users with good customer experience in Malaysia as it spreads across numerous segments such as shopping, dining, hotel and stays. Currently, this service is available at all outlets of Degem Collection, Eu Yan Sang, Lazo Diamond Jewellery, L’OCCITANE, Malindo Airways, Star Cruise, Swiss Luxury Watch & Jewelry, The Swatch Group, Vitacare Pharmacy and other merchant outlets frequented by tourists from China. Public Bank’s managing director, Tan Sri Dato’ Sri Tay Ah Lek said at the launch event that it will roll-out Alipay service to its existing and new in-store merchants. “We are very excited with the collaboration with Alipay, whose parent company Ant Financial is the world’s largest fintech startup. […].Alipay mobile wallet has become an alternative cashless payment for Chinese tourists,” he said. Alipay Southeast Asia general manager, Dayong Zhang added this partnership will enable Alipay payment acceptance at large merchant base of Public Bank and in the end create opportunities for local merchants to better target the large number of Chinese tourists coming to Malaysia. CASBAA has appointed media veteran Jenny Setnicker as head of advertising development, to promote the benefits of multichannel TV ..